Iceland is largely powered by geothermal energy, and as such, the hot water tends to have a slight sulfurous smell. This is particularly noticeable when when taking a shower. But because of all the geothermal activity on the island, there's also plenty of opportunity to enjoy a hot bath in geothermal-heated waters at numerous spas throughout the country. The most famous of these, of course, is the Blue Lagoon. On our tour the day before, our guide Bothi told us that in addition to the Blue Lagoon, there were many bath houses located throughout the country—there are something like seven in Reykjavik alone. Bothi told us these smaller (and much cheaper) bath houses are where residents come to debate politics, comparing them to coffee shops. We weren't so keen on debating Icelandic politics, and visiting the Blue Lagoon is an iconic part of a trip to Iceland, so we wanted to check it out. The Blue Lagoon is located about an hour or so south of the city, not too far from the airport. So once again we caught a bus at Hlemmer Square and took that to the large bus depot in Reykjavik, then boarded another bus that took us to the Blue Lagoon. The Blue Lagoon is a big man-made pool smack in the middle of a lava field. The water is fed in from the nearby geothermal power plant. The incoming water is under pressure and heat, and as it flows up through the lava bed it pushes up all sorts of natural minerals from the earth into the pool. When we visited, the air temperature was a nice 12°C (54°F), but the water temperature topped out around 34°C (93°F). Blue Lagoon can be very steamy. There are a few places in the lagoon, especially around the edges, where you can scoop up a handful of light blue mud and smear it on your face. This "mud," rich in sulphur, silicates, and other trace minerals, is said to have amazing healing powers. Consequently, there are many spa-goers lounging about with blue mud masks. 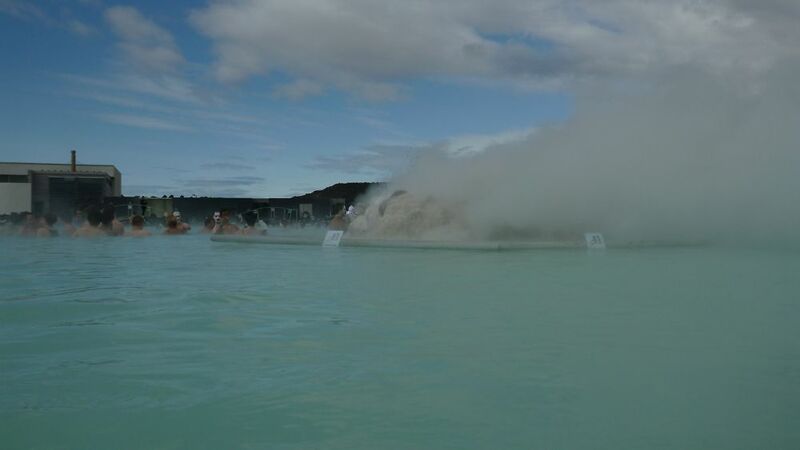 The Blue Lagoon has started to market this mud as a cosmetic, so there are also employees wandering about the pool offering free samples of the products that are on sale in the gift shop. The lagoon offers visitors different experiences, but we went in for one of the lower tier packages (at the bargain price of around $200 USD) that offered a free drink from the strategically placed bar in the center of the lagoon. But the Lagoon offers a wide range of options, including private rooms and exclusive dining at the on site restaurant (coyly named Lava). Walking in the lagoon can be a bit tricky. It's a lava field, after all, and in some places the rocks underfoot are slippery or jagged. Because of this, children under nine have to wear bright orange armbands to help keep them afloat. Jackie was a bit annoyed by this, but she still managed to enjoy herself. After spending a few hours soaking in the healing waters of the Blue Lagoon, it was time to head back to Reykjavik and enjoy our final Icelandic meal. After we returned ot Reykjavik, we went out for dinner at Tapas Barinn, a Spanish-style tapas restaurant in the old district. They serve a platter they call "Tapas Our Way," a multi-course feast which features Icelandic-themed dishes served tapas style. The meal starts with a shot of brennivin, the local strong moonshine-like liquor, and continues with lobster tails, sea trout, lamb, smoked puffin (which was tasty but a little chewy), and whale. The whale, I hate to admit, was particularly delicious. I also feel bad about eating whale and won't ever eat it again. The next day, our Icelandic layover was over. We left our apartment early, doing the Reykjavik bus shuffle again, this time heading for the airport. After a routine foray through customs & immigration and a bit of time lounging around the airport—our flight was underway. After a stay of almost three months, we finally left Europe behind. We'd clocked about 83 days in the Schengen area, just seven days shy of our visa allotment. About six hours later (but with a difference of only about an hour on the clock) we landed in Montreal, Canada, setting foot on the North American continent after nearly a year-long absence. All-day travel is strangely exhausting, so after taking a taxi from the airport to our hotel, we went right to sleep.